I recently finished reading Friendship, by Hugh Black for 5 Minutes for Books. My "full" review can be seen over there, but there were really so many aspects of this book that I found fascinating and interesting that I wanted to talk about it a bit over here as well. This book is really a most excellent treatise on friendship and I dare say that I won't find any book that is much better than this! 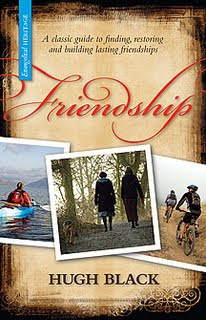 Friendship was originally published in 1898 and since that time it has not lost a bit of its luster. Black examines friendship from all angles, matching scripture to his message and viewing it in light of the ultimate friendship we would have with God himself. A marvelous study on relationship if there ever was one! "The lesson of life is death. Is that saying, "Death has no victory, we can live forever!"? Is it saying, "WAA HOO, I shall feel no sting and can avoid the grave!?" No, it is not. It is saying that sin results in the sting of death. But we can praise God because He has defeated the grave and if we walk through death we will rejoice in a victory of LIFE. We WILL die in numerous ways all throughout our lives. However, at the end of each individual death experience, and then the final physical one, we can shout out, "PRAISE GOD" because He has conquered the grave. He has conquered over broken relationships and miscommunications. He has healed soul wounds and ministered to our needs. He has met us in the valley and brought us to the mountaintop and THIS friends is why we can laugh at death and say we do not fear it. We may not like it but we need not fear it because God is bigger than death. With a shout of jubilee and some tears for the pain I've felt this year because of death, I say I never would have thought of the death of any friendship to be a good thing. (Mostly, I would say it is an awful thing that I cringe from and loathe.) However, if death of friendship points me towards life in Christ then what I thought as a negative is more of a positive than I realized. (I have to keep repeating that to myself.) It makes the burden easier. Black is quick to acknowledge hurt and, don't worry, quick to defend the value of a good friendship! However, thinking of deaths of friendship as something that God is using to teach me more about life is a wonderfully encouraging thing. 1898 -- things have certainly changed since then. I think that friendship has changed too -- some for the better and some for the worse. I love how people used to sit around and just BE, you know? What a great post. Thank you so much. Jesus it appears has created death defying escapes. How else can Paul say, "For to me, to live is Christ, and to die is gain." (Philippians 1: 21)... Gain ? The audacity of it.... just the kind of thing that ... must be true !